I have just moved to Byron Bay and have a Scrub Turkey (aka Australian Bush Turkey) problem. Do you have any clues as to what I should do to get my veggie garden going? As cities get leafier and new suburbs infiltrate surrounding bushland, some natives, like the koala, are losers. Others are winners. Scrub turkeys are thriving along the east coast. In the past twenty years, Brisbane’s population of Scrub Turkeys, a former game bird, has risen 700%. The ABC reports that turkey numbers are rising all along eastern Australia, spreading south from the subtropics into the warm temperate Sydney Basin. This is partly because suburban gardens offer good soil and mulch for nest mound-building and plentiful food all year round, whatever the weather. Populations have bounced back since they were protected from hunting in the 1970’s. Gardeners all along the coast are contending with these birds in places – and denser turkey populations – than ever before. It is the male Scrub Turkey that builds the mounds. Up to twenty or so female will lay their eggs in the mound. Mounds are built in shade, not in sunshine. Have a look at this Gardening Australia segment. This was recorded to give gardeners an idea how to deal with a resident population of Scrub Turkeys. 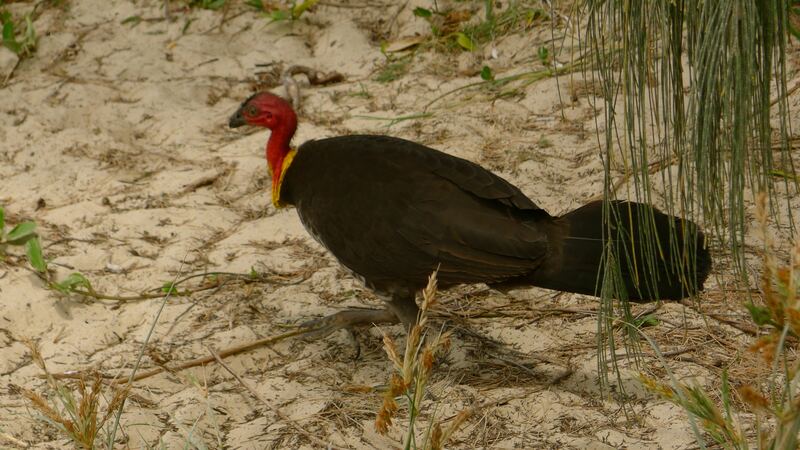 What can be done to protect gardens and plants from digging Scrub Turkeys? For a start, watch the segment I recorded on Gardening Australia with Darryl Jones of Griffith University, the world’s number one Scrub Turkey Whisperer. * diverting the bird’s attention to a shaded area of your garden. Provide mound-building materials, like mulch, soil, lawn clippings and leaves. Ideally, this sacrificial area should be sited next to at least one large tree providing 80 to 95 per cent shade. The brush turkey may be attracted towards the area, and may eventually take over the compost mound as its nesting mound. Scrub turkeys nest during the warm seasons, so you will have ready made compost to spread in your garden during the cool seasons. Other strategies include using tent pegs and pegs for mulch matting to pin down palm fronds laid in between valuable plants. By doing this it seems possible to keep topsoil in place and to protect roots. The bigger and heavier the frond, the better. Fruit cages effectively exclude them. You can buy modular ‘vegepods’ on line. These netted enclosures can be fitted over raised beds. Troughs can be placed on balconies, and you can grow herbs, flowers and potted collections on a first floor deck where they are unlikely to be raided. A landscaper in Brisbane’s Stafford Heights famously had great success using tall model pink flamingoes as scarecrows (‘scare turkeys?’). After installing them in commanding positions, his mulch stayed put! It is a myth that mirrors scare Scrub turkeys away. Mirrors make them grumpy. Scrub Turkeys benefit from revegetation, a diversely planted environment provides shelter and forage, yet they thrive under the protection of lantana thickets. Since gardeners use fewer pesticides, there’s more insect food for Turkeys. They’re efficient gatherers of caterpillars, but unfortunately, their broad diet doesn’t stop there. They like their greens too, and they like a varied diet. A vegie garden is Turkey paradise. But it’s the male Turkey’s habit of mound building – and constant adjusting of them – that causes heartbreak to most gardeners. In Scrub Turkey society it’s the guys who raise the kids. And that starts by building a cutting edge compost heap. One that can sustain a core temperature for incubating their eggs. Adding more green, leafy material helps to turn up the heat, while pulling the heap back cools things down. This is precise work. Could you sustain a compost heap at between 33-35C? Their beaks are accurate thermometers. Gardeners make hot compost which, by achieving a temperature of 60C, cooks weed seeds, perennial roots and bulbs, plus any diseases. Around one cubic metre of green waste is required for bacteria to generate enough heat to kill these problems. But if a prospective father turkey mismanages his heap it has serious consequences. Too cool, and they’re all boys. Too hot, and those gals may not carry the family name into the next turkey generation…As more gardeners start growing food, deep, friable garden soils are making nesting and incubating easier. Another win for Scrub Turkeys. It’s a dilemma. They’re pesky, disruptive and while there’s a need to cull, it’s important to maintain a balance. The first Australians ate Scrub Turkey and maintained sustainable bird populations within their native rainforest habitat. Maybe we can learn from them. One Scrub Turkey recipe I found recommends slow roasting them in foil, stuffing them with chopped apple and bacon, saying the “breast meat is white, tender and really tasty, the legs taste like duck, but are a bit stringy, and very enjoyable if crisped”. I’d struggle maintaining a compost heap as efficiently as they do. So these first fauna earn my respect – where it’s due. Mavis M. “Plenty at Lennox Head”. Janis C. “In Atherton, the locals are complaining that their chooks & ducks are being raped by scrub turkeys. They often use the pedestrian crossing to cross the road”. Steven O. “They’re everywhere no need to be a protected species”. Tanya van R. “Well the one in my garden destroys everything I plant! Merilyn H. “Jerry, we also have a lot here in Coffs Harbour, and they make a great garbage disposal and keep our indoor cats entertained”. Sylvia F. A. H. “They are in Geebung and Wavell Heights. There is scrub and underbrush along the creek lines – cover and mulch for making nest mounds”. Kay A. S. “Not if you have a Rottweiler that also thrives in the yard”. * Enclose the veggie garden in a fenced area. The Turkeys are poor fliers and don’t like being trapped in an enclosed space. * Surround ornamental plants with some rocks until they’re established to prevent them being dug up. * Design an area of the garden that you are happy for them to scratch around and and make a mound because they won’t go away! They will also return to that area to make another in subsequent years. * They can ‘sense’ if you don’t like them so make friends with them and they will bring entertainment value. The garden here has really benefited from the Turkeys as their scratching helps to aerate the soil and they remove pest insects. They are quite amusing to watch and interact with so embracing their ‘turkeyness’ is the way to go! Had this trouble at Toowong many (a few) years ago. Male bush turkeys are seriously stupid. He would build up a mound and we would know it down overnight. He’d come back the next morning and look at it as if to say “I’m sure it was bigger when I left”. Problem was he just kept coming back and rebuilding…in the new vegie garden we’d made for my mother. We gave up. A university came to study the mound…largest in the Brisbane are. Told us we’d never see the mother laying etc…Dad got photos. Seriously – when she was laying an egg that size she could not have cared who watched…dad claimed she was crying (I understood when I saw the size of the egg). Anyway…turned out in suburban Toowong we had had 30 eggs laid an about 12 chicks – the same uni dude de-constructed the mound for research. If you have one, don’t fight it – they’ll be back! I don’t really have room for a mound, especially a monster! I reckon the best option is to share, but if you can’t then this might help. It’s an ugly solution, but it works. Turkeys need to be able to scratch to collect material and this scratching can easily cover the whole yard. So as soon as they start building you get big sheets of concrete reinforcing mesh and reinforcing bar. Cut the bar into 30cm pieces. Cut the mesh into strips about twice the width of what you can reach. Arrange the strips on the ground in a way so that they cover all of the ground up to within a meter of the nest. Leave narrow walkways between the sheets, but make sure no walkway runs toward/away from the nest. Now hammer the pegs into the ground in the corners of each sheet and more so that none are more than 1m apart. Hammer in halfway [in sandy soil you may need to make the pegs longer]. Now lift the sheet and tie onto pegs near the top of the peg. This process will essentially create a floating mesh that is too low for the turkey to go underneath and too high for him to scratch the material over. any material he scratches onto the mesh higher than the mesh level simply push further under the mesh or lift the mesh a little. The mesh will prevent him from doing the one thing he has his mind set on doing and he will give up quite quickly. It is illegal to remove nests, but it is not illegal to prevent him from reaching the material he has scratched away and it is also not illegal to make it very difficult for him to collect material. The mesh should stay in place for at least 3 years, unless you know where he has moved to and he is happy there. you can plant annuals and small perennials through the mesh and use your garden pretty much as normal – with some adjustments. Just keep in mind that his main way of building is to sratch material to the site, so if this is interrupted as soon as he starts building he will be very limited in how he can get mulch to the mound. My name is Paul Savins, I am an orchardist in the Tenterfield district (New England NSW). I have listened to you through Tamworth ABC radio while I am working in the orchard. I also watch you on the Gardening Aust program. My wife Jenny is a keen gardener and an active member of The Tenterfield Landcard Community Garden. Jerry I do feel chained to some conventional farming methods. I am open to change, but find it hard to acquire good information on alternative methods of incect and fungal control that would be successful in a commercial orchard, methods that may keep us viable in a modern world. Perhaps you may like the challenge to help. We have a blog if you would like to look at it. They also like to build their mound in 70% shade. If you expose the mound to more sun by trimming back branches, they are likely to move on to another spot. ,only to have it destroyed.The people that love them,if they send me their adress ,happy to drop them over to their location. They are protected by law, and relocating is illegal. Just so you know. Thanks for the heads up Jerry but i am running out of options and money.Is there a plan b other than removing all the plants before they dig them out.Why do they need to scratch around continuously and then leave for a couple of weeks and then just after you mulch the garden they roll up again.It seems to be the male causing the most damage.How far do they roam from the mound normally.We are trying to find it and then have them relocated by a professional but it is expensive at $240 per bird. Scrub turkeys are protected. Relocation is responsible for spreading these birds even further, and it is illegal. My whole garden is turkey haven. However, I am trying to deter them and it is working to a certain extent. I have mulched and then put chicken wire over the mulch and pinned down with rocks or logs over most of the garden. I have turned one part of the garden into plain rocks. Got a couple of metres of small rocks and put seedlings and pots on the rocks. So far they have not walked on the rocks. Also have put teddy bears around the garden. For last week they have walked on paths but have not dug anything up. We live in a small town on the Sunshine Coast and have recently received an angry note shoved in our mailbox complaining about noise coming from our backyard between 5-7am. The neighbour is too stupid to figure out that our resident turkey who has been a regular visitor for years, is the culprit. He is doing damage but the turkeys are masterful at surviving against the odds. Live and let live I say. Will try to mitigate the damage to the yard for next year’s nest though. April 2019. I’ve got a now vacated mound on the Central Coast and wondering if I can shift it into the compost bin (three bin x 1 cubic meter) and use it for the garden later. I read that the male will still be interested in his mound even though he is not actively breeding now. If he leaves, another male will take over. I’ve also been told that a movement triggered water spray device will put them off before they start building their mound next spring so am going to try that soon. My neighbour has one but apparently also available at hardware/garden stores. Kind of nice birds, our is called Bertie, BT for short, but I’m interested in developing a garden and not to keen on the competition. They make great efforts to create excellent compost. Why waste it?